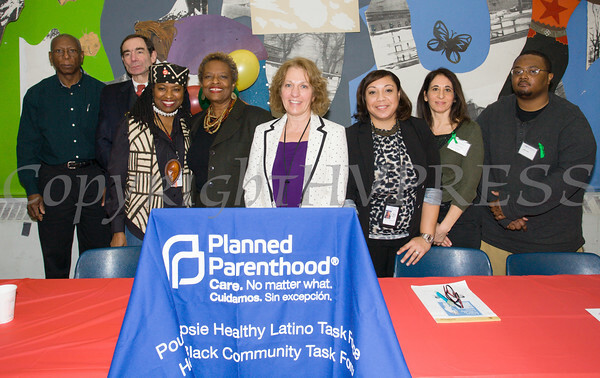 The Poughkeepsie Healthy Black and Latino Coalition celebrated Black History Month with a Healthy Living Expo at the Family Partnership Center in Poughkeepsie, NY on Saturday, February 27, 2016. Guest speaker Dr. Walter Woodley, with panelists Dr. Joshua Jaffe, Ozie Wiliams, Arlette Murrain (master of ceremonies), Nancy Lenhert, Sandra Carasquillo, Jo Ann Brown and James at the Poughkeepsie Healthy Black and Latino Coalition celebration of Black History Month at the Family Partnership Center in Poughkeepsie, NY on Saturday, February 27, 2016. Hudson Valley Press/CHUCK STEWART, JR.